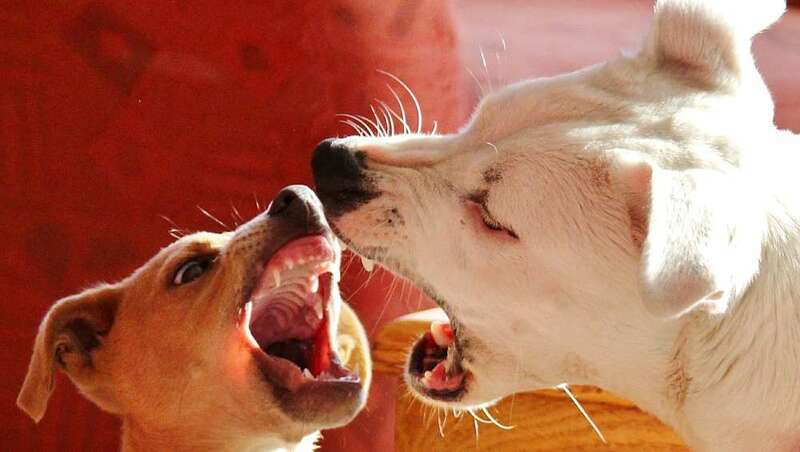 One of the most commonly asked dog training questions is how to stop a dog from barking? The key to answering this question is to understand why your dog is barking in the first place. When your dog barks at the window they’re exhibiting territorial behavior. The same is true when they bark at the front door or in the back garden. What they’re doing is warning people to stay away. In your dog’s mind, it’s the pack leader’s duty to protect the pack at all costs. And if your dog’s involved in the decision making, they’ll soon start to act as the pack leader. This will lead to excessive barking at every perceived threat. If you let your dog go to the door and let people in, you’re giving them a position of responsibility. You’re letting them act as the pack leader by deciding who comes into the house. And if you own a small dog, the worst thing you can do is carry them while you answer the door. Dogs see height as dominance and by lifting them up you’re making them feel more dominant. This in turn makes them feel more of a leader, and this will only lead to more barking. When the postman approaches your front door, your dog starts barking at them. The postman delivers the letters and then leaves. To your dog, this is a success – he’s scared the postman away! This only reinforces his barking behavior. He thinks he’s seen off the intruder and performed his task of protecting the pack. So how do you stop your dog from barking at the door? What you should try to do is to keep the dog back while you go forward. Your dog needs to learn that you’re the leader and it’s your job to let people in to the house. If your dog starts barking, it’s important you don’t get upset. You don’t want to lose your temper and start shouting at your dog. This’ll just make them think there really is something to worry about, and they’ll bark all the more. So the best thing you can do if your dog starts barking when someone comes to the door is to stay calm. The aim is to portray the correct information to your dog. You want them to know that what’s happening is natural and nothing alarming. This can be difficult in real-time when a stranger does come to the door. You’re in a rush and you’re embarrassed because your dog is barking at them. So you’re more likely to get flustered and upset. The best way to avoid this is to train your dog on a regular basis with the help of someone else. So enlist the help of a family member, neighbor or friend, for example. Get whoever you’ve roped in to help to approach your door. If your dog starts barking, you should assume a position of dominance. Place your hands on your hips to make your body appear wider and more dominant. Also, stand upright with your chest puffed out and your head held high. Stand in front of your dog – between them and the door or window – and give a firm command such as “Back” or “No”. This creates a boundary for the dog. Repeat this training on a regular basis, until your dog learns you’re the leader. They need to know that you’re the decision maker about who comes to the house. Another barking training technique you can use is what’s known as de-sensitization training. You’ll need two helpers for this. Put the leash on your dog and then get your first helper to knock on the door or ring the door bell. Your dog will probably start moving towards the door while barking. At this point, turn around and start walking in the opposite direction with your dog. Let the second helper open the door. Once your dog calms down, show him the trigger point for the action you just took. That is, show him the knock on the door, or the door bell. Then repeat the training again. Once again, it’s important you remain calm and unflustered throughout this training. The idea is that it seems like the natural thing to do for your dog. Then he learns that it’s someone else’s job to answer the door and decide who does and doesn’t come into the house. You can solve problems with your dog barking in the back yard or garden in pretty much the same way. So if your dog is barking at the fence or gate at the end of the garden, walk down to where they are. Put your hands on your hips and stand upright to appear dominant. Then place yourself between your dog and the fence or gate. Step towards your dog, making them move backwards. As you do so, say in a firm manner “Back” or “No”. Again, enlist the help of a family member, friend or neighbour to take part in training exercises. Get them to knock on the fence or gate, or walk past the fence. As they do so, train your dog not to bark as described above, and to learn that you’re the pack leader. Once again, you must stay calm and relaxed during the training. If your dog tends to rush out of the back door first as soon as it’s opened, you need to put a stop to this behavior. As the pack leader, you should be the one leading the way through the door. To teach your dog this, you can use the leash. Put your dog’s leash on before opening the door. If your dog still rushes out first, then come back in straight away. Keep doing this until your dog lets you go first. This may take a lot of repetition, depending on your dog. Once you’ve got to this stage, walk around the garden boundary (the fence, hedge or wall) with your dog. Make sure you keep the dog on the leash and your body between your dog and the boundary. This is giving the dog the message that you’re in control of this area of the garden and are the leader. Once more, it’s important to do this in a calm, relaxed way. This shows your dog that you as the leader don’t have a problem with this area, and neither should they. As with all dog training, you should use positive reinforcement. Reward the correct behavior with lots of cuddles, attention and treats.